Earlier this month, the smashingly charismatic founder and leader of Bonny Doon Vineyard (Twitter) wrote an article that got me thinking…again. Randall Grahm (Twitter) is as much a household name as can be found in the wine biz, as the founder, longtime winemaker and quixotic leader of the alternating huge and boutique Bonny Doon winemaking endeavors over the decades. Part devoted vigneron, part Biodynamic cheerleader, part shaman and part brilliantly funny and educational writer…it is difficult to try and put Grahm in a box. Indeed, if you were to try, he’d probably try and find the best, most neglected grape variety in which to grow in that shaded box. One thing that cannot be said about Grahm is that he isn’t willing to risk everything in order to find the best place to grow the best grapes. So, what was this article that got my mind running and my palate thirsty? First off, a description of Grahm’s writing style is in order: You can find more footnotes than your average college textbook of his seemingly random pop culture, classical and modern music, Latin and/or philosophy references in each piece…or even paragraph. Yet each reference really does connect perfectly with the overall flow of each essay and while filled with whimsical puns at each turn, tie together the web of intellectual, seemingly disparate thoughts which Grahm is intending to legibly secrete from his darting mind. His writing is so renowned that he recently released an anthology of his many wine parodies, essays as a self-commanded “terroirist” and a major proponent of Rhône varietals of wine over the last 30+ years. Been Doon So Long is a fascinating read and one that, while challenging for the intellect and vintellect, is a hugely entertaining and hilarious tumble through the ups and downs of now 31+ years of winemaking in California (I received a signed sample copy). Grahm does not humor dullards nor the stupid people of the world, yet he is also very humble and at times consumed with self-doubt, all of which is reflected in his writings over the years to his wine fans and club members. Having the fortunate chance to chat with Grahm after his induction into the Vintners Hall of Fame for 2010, I’ve happily learned that he is much the same in person as he his in his writings. All of his various forms of writings are included in this compendium including poems, essays, stories, speeches and much of the most provocative artwork that has been featured in his newsletters and on his highly unique wine labels. I highly recommend opening a bottle of one my fav’s, the Bonny Doon flagship Le Cigare Volant after purchasing the signed tome and kicking back with some very engaging wine writing. 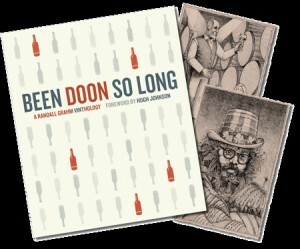 It is with this history of wine making and writing that I can now explain the stimulation which I received from Grahm’s latest article on his fine book/blog vinthology site that is also called Been Doon So Long (and well designed by WineLog’s own Jason & Kim Coleman via their Stranger Studios arm). His latest post, The Bee’s Knees, touches on the recent sale of his former wine property Pacific Rim and an update on the slow development of his dream vineyard in San Juan Bautista. It is within the comments for this post that I came across a reply of Grahm’s that included a tidbit about the challenges that will surround their use of dry-farming the SJB vineyard – namely that the little vines will need to their roots to dig 600 feet before comfortably finding a consistent water table! This small statement, replete with some juicy biology geekiness, set my mind wandering…can grapevine roots really reach 600 feet!? No way, I thought and I eventually wandered over to other parts of the interwebs. Not even a few days later, I happened upon a fascinating article about the Croatian wine renaissance in the Jakarta Globe and there they detailed vines whose roots exceeded 200 meters in depth! I tweeted over to Randall that my disbelief was unfounded and yet another interesting wine fact was filed into my humbled brain. It’s continually heartening to find that not only am I the only one that geeks out on the smallest bit of wine info, but that this tendency has been repeated in others throughout history, including those in my own wine backyard. Check out many of the wines in WineLog from Bonny Doon Vineyard in the list below and let me know your favorite wine made by Randall’s busy hands in the comments below. Cheers! Book Review: "Sippin' On Top of the World"
What??!! No Vin Gris de Cigare, the best rose on the planet? What gives?? Heh, thanks for the comment! I actually really enjoy that wine as well. This list is actually only the first 20 most highly rated wines in WineLog out of the hundreds of Bonny Doon wines that have been rated by members. Upload and rate the rosé and maybe it will start showing higher. 😉 Cheers!